James J. Woolley (September 26, 1966 – August 15, 2016) was the touring keyboardist for Nine Inch Nails during the later Pretty Hate Machine tours (most notably Lollapalooza 1991), and toured with them through roughly half of the Self Destruct tour, including their Woodstock performance, before being replaced by Charlie Clouser in December 1994. He left for family reasons. He spent some time briefly in the studio with Trent Reznor, Chris Vrenna and Danny Lohner during The Downward Spiral recording but never had any known contributions that made it to the release. Woolley appears in the NIN music videos for "Wish" and "March Of The Pigs". 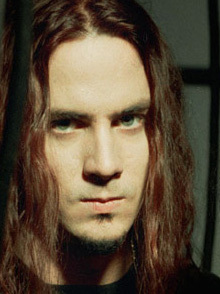 Prior to joining NIN, Woolley had worked with early NIN opening act Die Warzau, alongside Chris Vrenna. Years later, Woolley once again worked with Die Warzau and toured with Nothing Records act 2wo. He eventually became the leader of a band called V.O.I.D. Woolley passed away on August 15, 2016, from injuries he sustained after falling from a ladder. This page was last modified on 22 August 2016, at 20:12. This page has been accessed 59,693 times.